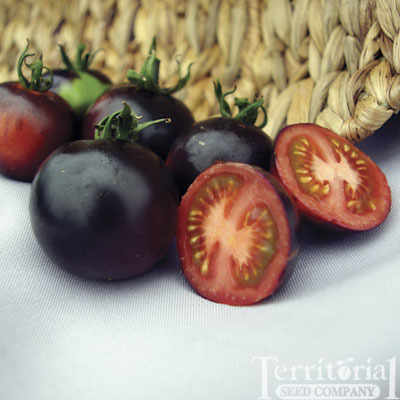 Beguiled by its beauty, we planted two Indigo Rose tomatoes this year and they clearly are going to be the most prolific tomato plants in the 2013 garden. A gardening neighbor wandered by last weekend and asked about the little dark-purple fruits. I told him the jury was out, and offered him one to taste. That last comment was the most positive in the online chat, and I’m trying to be brave since we (obviously) are going to have scores if not hundreds of the little charmers. Indigo Rose was developed in the 1960s when two scientists cross-cultivated tomatoes with wild species from Chile and the Galapagos Islands, seeking the magic antioxidants that promote good health. So: My new attitude is that I’m going to promote the “super food” aspect and exotic coloring of these tomatoes. This definitely is a cautionary tale. If you’re going to experiment with an unknown tomato, buy ONE and let it prove itself. P.S. I whirled some Indigo Rose tomatoes into the first gazpacho of the season, and they were delicious in concert with cukes, parsley, garlic, scallions, V-8 juice and seasonings. Does the Indigo Rose really have red flesh? Looks delicious!